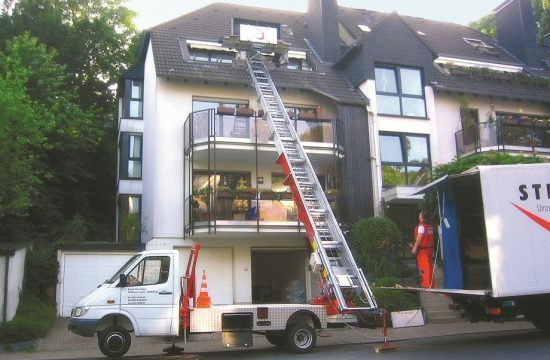 Often in construction there is a need for creating risk-free and economical options for transporting items and objects from high floor apartments, buildings and so on. Our construction hoists offer reliable and safe options for transporting goods at varying weights and heights. 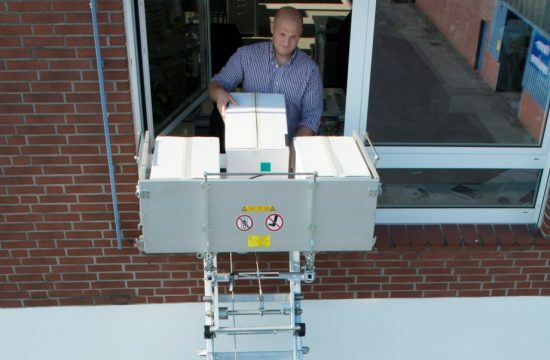 We have three different types of external elevators for hoisting goods, furniture and equipment to height; this is a quick, efficient and economical way to hoist up a known quantity during a delivery or move. Please contact us so we can help you make the right decision depending on the job you want to complete; there are several factors to consider when selecting the right elevator. Take a look below to view the lift options we currently have available. Powered by Honda engines, the Truck Mounted Elevator is top of the range when it comes to mobility and precision, making it a safe and easily accessible lift. It is particularly suitable for hoisting up a known quantity in a pre-arranged time span. Installed in 15 minutes and supplied with a trained operator. A lifting height of 3 to 27 metres. 300kg – 400kg lifting capacity. Maximum carriage speeds of 60 m/min. A perfect option when looking for an affordable and reliable lift, individualised by its powerful and sturdy construction and ease of use. Fits through exceptionally narrow gaps, due to its retractable axle & requires minimum set up space on site. Lifting height of 3 to 18 metres. Working radius of 360 degrees. Small and easily accessible with a compact design. 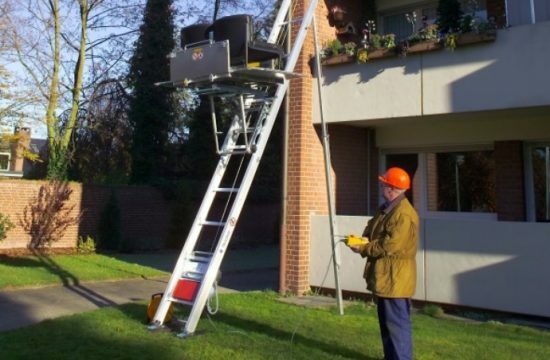 Lightweight and practical, the 240V Demountable lift is portable and easy to put together – the aluminium rails can be screwed together quickly – and it is suitable to be placed on grass. Made up of sections so fits in small spaces. The platform spreads out to 2700 x 1465mm, but these dimensions can be exceeded by the item to be loaded, as long as the load is secure and safe. 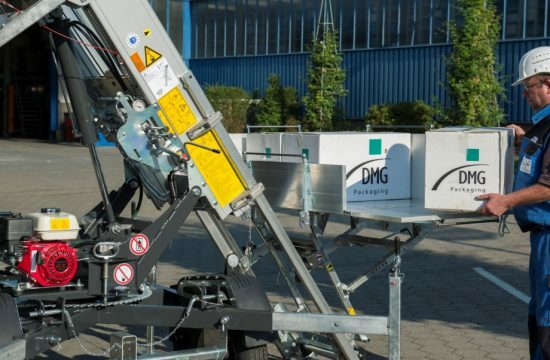 It can be stopped at different heights to assist in loading and off loading at ground level. 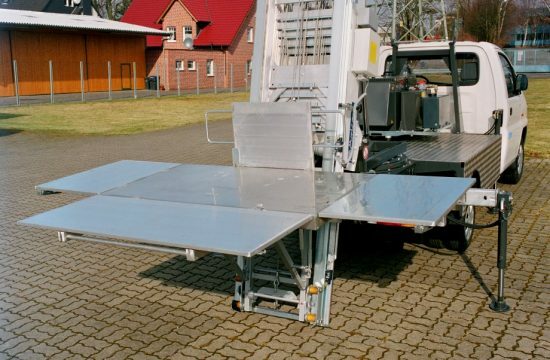 The loading platform rotates for ease of use. Long items can be loaded directly through a window or doorway. When the platform reaches window level, it can be pulled towards the user to assist in off loading. All sides fold down independently, allowing various configurations. A secure box for small goods, a channel for long items, and a flat floor for larger goods. There are plenty of convenient tie-down points for complete safety. The load can be precisely levelled with the adjustable legs and the telescopic ladder sections give a large height range. The winching mechanism is electronically controlled, with soft start, normal travel and automatic soft stop. A control box on the top section allows the platform to be lowered to ground level. The carriage wheels are made from industrial nylon for smooth running and the pneumatic wheels protect the building – these can be ex-tended for stability or to straddle larger openings. High Reach Systems help you move bulky items or those in an awkward location in minutes making your job a whole lot easier – give it a try!